They may have originated in Greece, but grunge punk rockers BARB WIRE DOLLS prove their prowess on LA's Sunset Strip and beyond with their new music video for "Heart Attack", directed by LA-based writer and photographer Steve Appleford. As if having the "seal of approval" from greats like renowned KROQ DJ Rodney Bingenheimer, MOTORHEAD's Lemmy Kilmister and other reputable rockers isn't enough - BARB WIRE DOLLS and smoldering lead vocalist Isis Queen put their marker on the map in the new video, which features the band performing their raucous live show on location and up-close-and-personal at the legendary Whisky A Go Go. It should be mentioned, impressively, that BARB WIRE DOLLS became the house band at the Whisky within a year of migrating to the United States. Take a look at the brand new "Heart Attack" video now on KNAC.COM right HERE. "Heart Attack" is featured on BARB WIRE DOLLS' new album, Desperate, which hit stores in North America this summer via Motörhead Music/UDR. Don't confuse BARB WIRE DOLLS as just another local act - since forming, this international group has gone on to melt ears and hearts on 700 stages across 22 countries in just under five years - consistently selling out club dates in America, the UK and Europe.This year, the band even performed at Germany's Wacken Open Air, the largest metal festival in the world. Hailing from an artist commune on the island of Crete, the band sold everything they owned and left crisis-ridden Greece in 2010 for their current home in Los Angeles, at the invite of aforementioned KROQ DJ Rodney Bingenheimer. Upon their arrival in California, BARB WIRE DOLLS immediately sold out the world famous Roxy Theatre in Hollywood, boasting a live show that is second to none. Electrifying rock of this magnitude did not go unnoticed by the elder statesman of the Sunset Strip, the incomparable, irreplaceable Lemmy Kilmister of MOTORHEAD. After seeing BARB WIRE DOLLS live, Lemmy took an immediate interest in the band and placed them under his supportive wing. BARB WIRE DOLLS are one of the most vital new bands in music today, representing all that is inspiring and furious about rock and roll. The band intelligently weaves sub-genres of punk, grunge, and metal, producing an urgent sound that is truly unique. Desperate contains gripping rock tracks, empowering anthems, and hard-edged thrashers, all performed with the classic punk rock energy the band has become internationally known for. 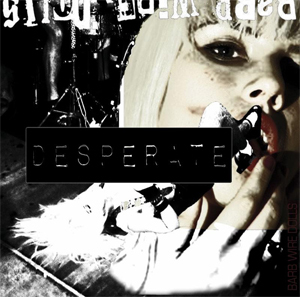 Recorded at Sonic Ranch and NRG studios, Desperate was produced and mixed by Grammy award-winning producer Jay Baumgardner (BUSH, EVANESCENCE, LACUNA COIL) and mastered by Grammy award-winning mastering engineer Howie Weinberg. BARB WIRE DOLLS' cultural and musical immediacy is not to be missed.